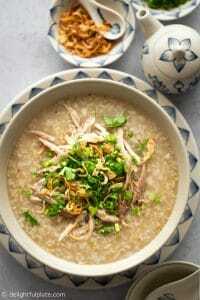 This Chicken Congee with Brown Rice is an improved version of Vietnamese classic chicken congee. It is healthier, more flavorful and will keep you full longer. Cooking this congee with a pressure cooker yields a perfect creamy texture in a short amount of time. Brown rice is whole-grain rice, which means it is less processed than our regular white rice. As a result, brown rice retains more nutrients and fiber than white rice. Therefore you will feel full longer when eating brown rice instead of white rice. Moreover, brown rice also has a nuttier and richer flavor than white rice. 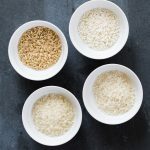 Congee (also called rice porridge) made with brown rice will give you more health benefits and flavors than congee made with just plain white rice. It is easy to use brown rice for congee as long as we keep several things in mind. Brown rice is not as starchy as white rice and it is harder to digest than white rice. That is why I recommend using a mix of brown rice and white rice to make congee instead of going with 100% brown rice. 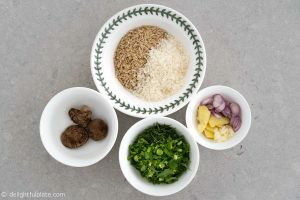 Keeping some white rice ensures the congee will still have a silky, creamy texture and be light enough on the stomach. In the same amount of cooking time, brown rice doesn’t absorb as much liquid as white rice, so we should use less liquid. We will also need to increase cooking time. For example, in my Ground Pork Congee recipe which used 100% white rice, I only needed 10 minutes of pressure cooking. With this brown rice congee, I needed more time than that. 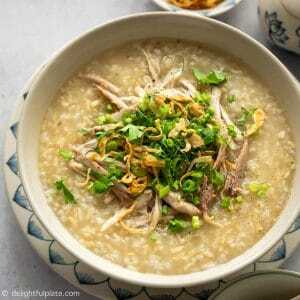 Chicken Congee (chao ga in Vietnamese) is a very comforting and delicious dish. It can be eaten in any meals and we especially love to eat it when the weather is cold or when we don’t feel well. You will need brown rice, white rice, whole chicken or chicken parts with bones, aromatics, seasonings, and herbs. For white rice, you can use long grain white rice like jasmine rice, short grain like Japanese or Korean rice, or sticky rice. Short grain white rice and sticky rice are both starchier than jasmine rice. When I make this, I use short grain white rice. Of all the aromatics suggested in this recipe, ginger is the one you should not skip. If you don’t have garlic, shallot or dried shiitake mushrooms, it’s okay but the congee is less delicious quite a lot if you don’t add ginger. Also, try to find kaffir lime leaves since it adds another dimension of flavors and brightens the dish. I mentioned in my Chicken Vermicelli Noodle Soup how well chicken goes with kaffir lime leaves in Vietnamese cuisine. You can buy them at Asian grocery stores, usually in the frozen section. They freeze very well. 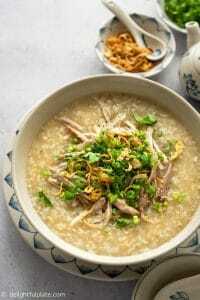 When eating this congee, you can add more toppings such as fried shallots, Chinese cruellers or even crispy fried wonton strips. Using an electric pressure cooker such as an Instant Pot is the best way to cook congee. 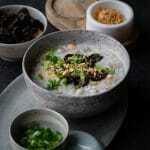 To me, delicious congee should have a silky, creamy texture while each individual grain is soft and still discernible. If you are short on time, you can definitely throw everything straight in your Instant Pot and hit Start. I personally like to use the Sauté function to sauté the aromatics and rice to bring out their flavors before pressure cooking. It doesn’t take much time to do that :). Then we can pressure cook it for about 25 minutes. After that, let it release pressure naturally before opening the lid. Finally, adjust seasonings and serve the congee with a lot of fresh herbs and your favorite toppings. Prep all ingredients. Rinse the rice under water. Submerge dried shiitake mushrooms in hot water for 3-4 minutes to rehydrate them (if using). Slice ginger, shallot and mince garlic. Turn on your pressure cooker and choose Sauté mode. Once the pot is hot, add a little olive oil. Add shallot, ginger slices and garlic and sauté until fragrant. Add both brown and white rice and continue to sauté for 30 seconds to a minute. Add chicken, 4 1/2 cups of water (or half water, half chicken stock), dried shiitake mushrooms (if using) and salt to the pressure cooker. Switch to pressure cooking mode and cook for 25 minutes. Once pressure cooking period is over, let the pressure cooker release pressure naturally. This may take 15-20 minutes. Carefully open the lid, remove the chicken pieces and shred the meat. Discard the bones and skin. Switch the pressure cooker to Sauté mode, gently stir, add a teaspoon of fish sauce (more or less to taste). Adjust the consistency of the congee by adding more water or heat it longer with Sauté mode. Add chicken meat back to the pot to warm it through. Transfer congee to servings bowls, top with plenty of freshly cracked black pepper, scallions, cilantro and other toppings you like. For white rice, you can use long grain white rice like jasmine rice, short grain like Japanese or Korean rice, or sticky rice. Short grain white rice and sticky rice are both starchier than jasmine rice. When I make this dish, I often use short grain white rice. 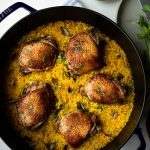 When I use a whole chicken to cook this dish, I usually par-boil the chicken for a couple of minutes. You can use a combination of chicken pieces with bones such as thighs and drumsticks. Don't stir the congee too much or too vigorously after it is cooked. We don't want to break the grains too much. If you don't have garlic, shallot or dried shiitake mushrooms on hand, it's okay to skip them. However, do not skip ginger. There may be some slight differences among different brands of electric pressure cookers, so experiment with cooking time to achieve the consistency you like. If you are short on time, it is okay to throw everything straight in your Instant Pot and hit Start. I personally like to use the Sauté function to sauté the aromatics and rice to bring out their flavors before pressure cooking.